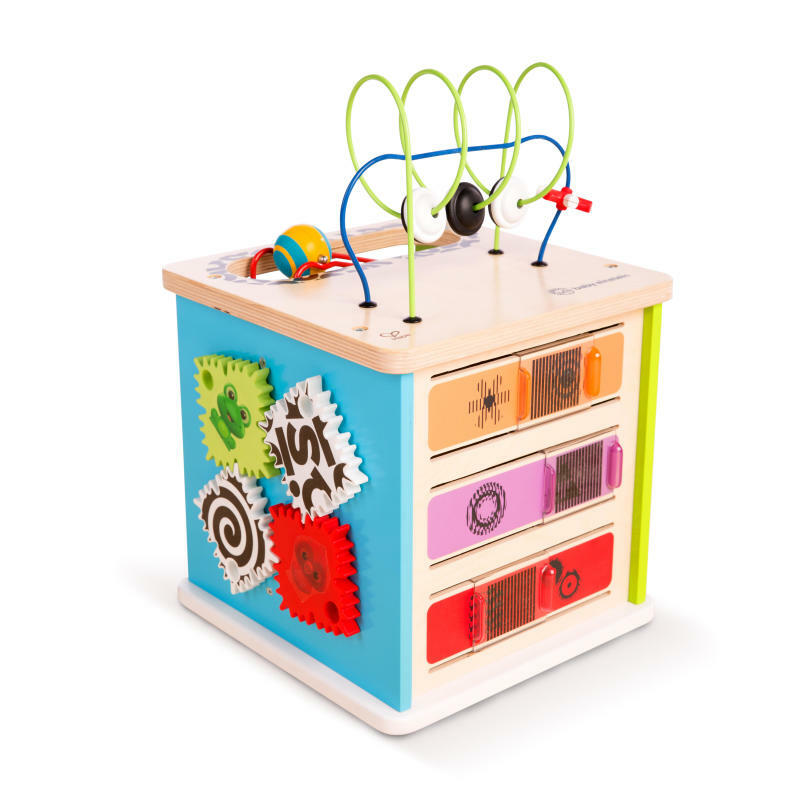 Innovation Station Activity Cube is rated 4.8 out of 5 by 17. Dimension (in) 12.5" x 12.5" x 19"
Rated 5 out of 5 by Naty1223 from Entertaining I absolutely love this toy. It keeps my kids very entertained. I think it might have to do with the design and the color. It’s bright colors and unique shape keeps my toddler intrigued. She just can’t seem to stay away from it. I really recommend this product to anyone. Can’t beat the quality and durability. Rated 4 out of 5 by Nicolem529 from Keeps Her Attention I like this activity cube because it holds my daughters attention for about 15 minutes. Which is forever in toddler time. She likes touch all of the colors when I ask where the red box is. This toy gives me lots of opportunities to communicate with my daughter. I can ask her to point out items or colors and it seems to help me by giving me ideas on things to ask her. Rated 3 out of 5 by Danyellxo from Love the colors! We love the bright colors and bold patterns. However it didn't seem to hold their interest long. The seemed to most enjoy the rolling ball. I wouldn't buy this for someone, just because it doesn't get much attention around my several kids. Rated 5 out of 5 by Beth6 from Lots of fun! My children ranging 3 years to 12 have all found fun in this activity cube. They love the magnetic parts of it very much! They have so much fun with it. Rated 5 out of 5 by Katlinwatts15 from Activity cube My kids love playing with the cubes at the doctors office, but I hate how dirty they are. We got this and it’s very well built! You have to unscrew the top and flip it around to get the rest of the activity’s out, but it’s extremely simple! My boys are already going crazy for it! Rated 5 out of 5 by Katlinwatts15 from Activity cube My kids love playing with the cubes at the doctors office, but I hate how dirty they are. We got this and it's very well built! You have to unscrew the top and flip it around to get the rest of the activity's out, but it's extremely simple! My boys are already going crazy for it! Rated 5 out of 5 by Erika from Love the cube! My daughter LOVES this cube! She plays with it daily, multiple times a day. I personally don’t like the ball portion bc we’ve “lost it several times. Of course it shows up but wish it didn’t come off. Otherwise great!! !